Bonnie Hunter is doing a Mr Linky of First Quilts. I’ve posted about this quilt in the past, but thought I’d bring everything together in a single post. 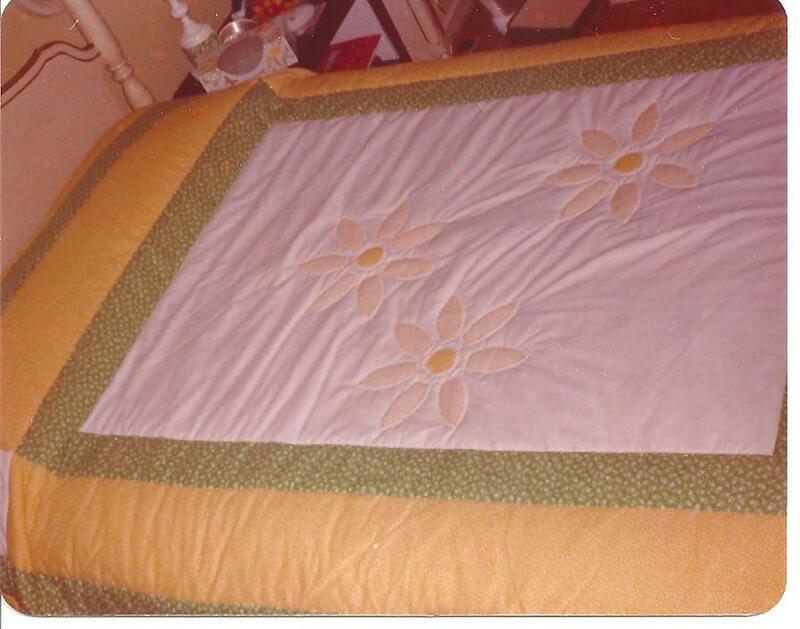 As a young child, I remember sleeping under quilts made by my grandmother “Momma Craft”. We visited my dad parents a couple of times a year, but I don’t remember seeing her sew or quilt during our visits. Today, I can’t even remember the quilt, just sleeping under it. Then around the Bicentennial , my mom took a quilting class. I think this was the first time I was exposed to quilt making. 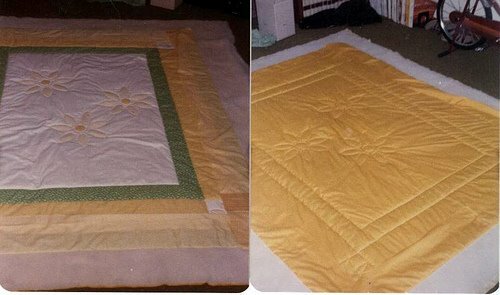 My very first ‘quilt’ was a quilted pillow top. I can remember the denim blue, brown yellow and red calico and that it was done for a visual aid for a math class. I’ve recently looked through old photos to see if I could find a picture of it, but had no luck. What I really consider my “first quilt” is the one pictured above. This was an assignment in my Sewing for the Family class (I also made a size 2T middy dress, a man’s dress shirt and a blouse for my mother). A simple tied 9 patch, tied would have met the requirements, but I wanted quilt for my bed. So I designed this quilt. As with many other quilts from this time, I had a polyester batting — and I had to sew two sections together. 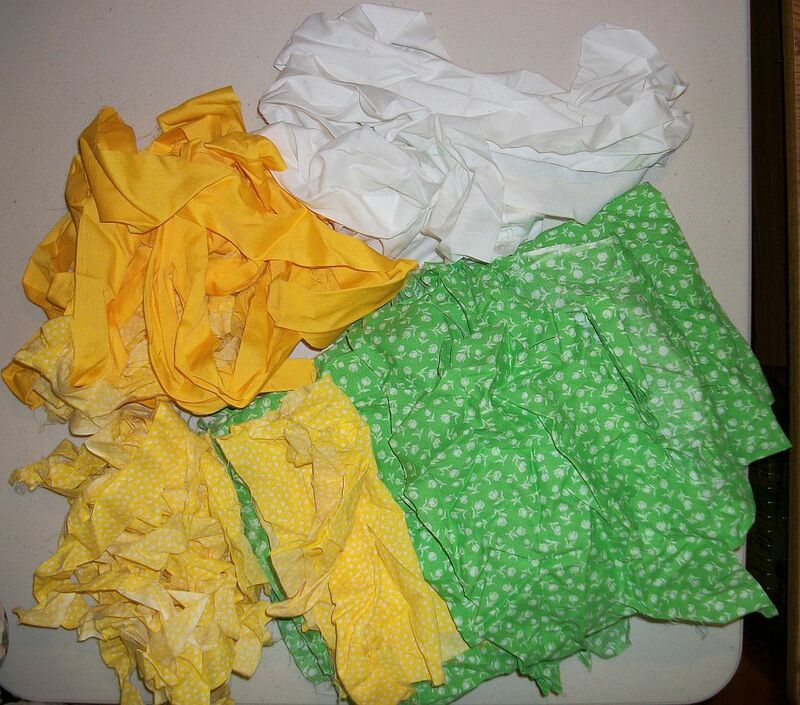 This set of pictures show exactly how much quilting was in the the quilt. Yep — next to none. Just stitch in the ditch and a little bit of hand stitching around the petals of the flowers. I used that quilt for years. Turn it width wise and it fit nicely on our king size bed. But between the lack of quilting and the bad basting job I did on the batting, the stitching eventually came out and the batting rolled up. At that point I could no longer use the quilt — but for the life of me I don’t know where it is. I really would like to find the quilt. After quilting for the past few years, I’m confident that I can fix it. Now what is really weird, is in the last couple of years I found the scraps! Glad you have photos to remember it by. It was loved to death! I had to scan a picture from my photo album to get my first quilt picture up. I wanted to show it in the original colors, it is so faded. Had to love that Polyester! What a lovely first quilt. Thanks for sharing with us! what a chuckle–have you saved it or do you think you tossed it? If I tossed it, it was by accident. I wanted to fix it, just didn’t know how at the time.